A clear-up is under way in parts of Scotland after the remnants of Hurricane Ophelia damaged buildings and brought down trees overnight. Met Office yellow warnings had been issued for much of southern, central and eastern Scotland after wind speeds hit 76mph in some areas on Monday. Trees have been blown down, blocking roads and causing disruption to some rail services. Part of a tenement block in Glasgow collapsed on Tuesday morning. No-one was injured in the incident at the block in Albert Road, Crosshill, which had previously been earmarked for partial demolition. Around 1,100 south-west homes were without power on Tuesday morning. During the height of the storm on Monday evening, high winds saw roofs being blown off buildings in Castle Douglas and Dumfries. Scaffolding was also brought down in Kirkcudbright and dozens of trees were blown down. The worst of the conditions in Dumfries and Galloway appeared to pass on Monday night. However motorists were urged to take extra care during Tuesday's morning rush hour as the storm moved across parts of the rest of the country. High wind warnings were in place on the Erskine, Clackmannanshire, Tay and Friarton bridges and on the new Queensferry Crossing. Ferry sailings between Cairnryan and Northern Ireland were subject to "major disruption" due to the weather, said P&O Ferries. Meanwhile, ScotRail said the line at Markinch had been blocked after a freight train hit a fallen tree, causing severe disruption to services throughout Fife. The remnants of the hurricane are expected to head out over the North Sea later on Tuesday, with the weather improving dramatically by late afternoon. 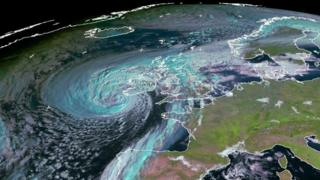 Ireland suffered the worst of the storm on Monday, with two men and a woman killed as winds of almost 100mph caused widespread disruption. It arrived on the west coast of Scotland on Monday afternoon. BBC Scotland reporter David Allison was in Portpatrick when the peak of the storm coincided with high tide at about 22:00 on Monday. He told BBC Radio Scotland's Good Morning Scotland that "spectacular" waves crashed over the harbour wall, flooding one house and the coastguard station. And he posted a video to Twitter showing damage left by the storm, including a number of large rocks washed over the harbour wall. Overnight more than 190 calls were made to police in Dumfries and Galloway, many of which were weather-related. "In particular, calls relating to fallen trees blocking roads were prevalent and at this stage there are still a number of minor roads affected by fallen trees and branches, from Langholm and Moffat in the east of the region through to Stranraer and Portpatrick in the west", a Police Scotland spokesman said. "At this time all major routes through the region are open. Police Scotland urge those heading out to work or on other business to still drive with care." He said no one had been injured during the storm and he added: "A number of homes in the region have remained without power overnight and efforts are under way to bring power back to those affected. "In this regard communities are asked to check on those who might be described as vulnerable neighbours and, where safe to do so, to check on their welfare." BBC Scotland weather forecaster Gillian Smart said south east and central Scotland would be worst affected on Tuesday morning, with winds likely to reach between 50-60mph in many areas and occasional gusts as strong as 70mph. She added: "Conditions will improve slowly through the day, and by the end of the afternoon winds will be much, much lighter and most places will be dry. "So your commute home will be a much more pleasant experience than your journey to work this morning." Please do not put yourself in any danger to take images and please heed all safety warnings.